Easy Bypass Installation and Operation. Dimensions: 48" x 1.1" x 1.1"
✔ BALLAST BYPASS. 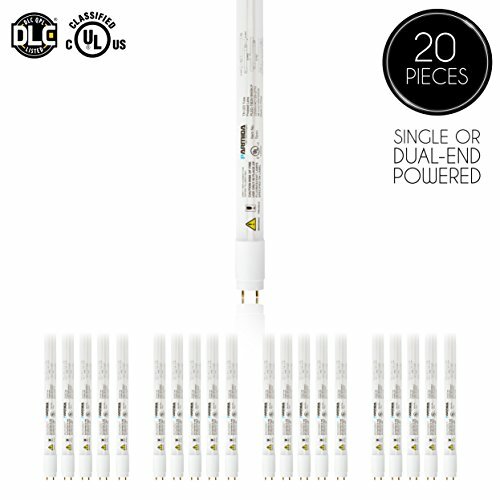 These tubes can be installed by a simple bypass of the ballast. Bypassing the ballast during initial tube replacement will save you both time and money as ballasts inevitably fail over time and will require replacement. Ballasts also consume electrical power and by bypassing them you will save even more on your energy bill. ● SIMPLIFIED INSTALLATION. This tube installs directly into your fixture's original shunted sockets (tombstones), which means you will not need to retrofit your fixture with non-shunted sockets. This tube is UL-Listed for installation with a single and dual-ended connection. Fast and simple installation under the functionality of your choice, this tube is designed with user experience as the defining motivator.